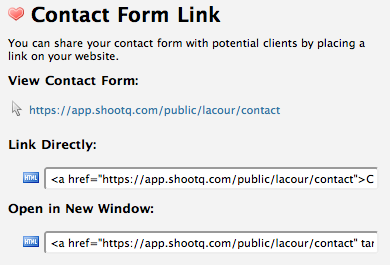 The easiest and most reliable way to connect your website or blog to ShootQ is by simply linking to your ShootQ-generated Contact Form. The first thing you need to do is set up the Contact Form. If your website allows you to link to a URL outside of your domain, you can set your site up to redirect clients to this URL when they click on your website's existing "Contact" link. This option displays HTML code for a button which can be embedded into the body of your site. When the client clicks on that button, they will be redirected to your ShootQ-generated Contact Form. This final option is virtually identical in function to the previous one, but rather than redirect the client from your website it will open your ShootQ-generated Contact Form in a new window. When using options two or three, you will want to make sure to disable or hide your website or blog's contact form, if it includes one.